Last night was the Wonderful Women Christmas Party. Obviously if you are freelance or self employed you don't traditionally get a Christmas party, so the #wwmoob party is our very own celebration! There were two rules. Christmas jumpers would be rewarded, and you had to bring a secret santa gift (which would be randomly assigned to a reciever). 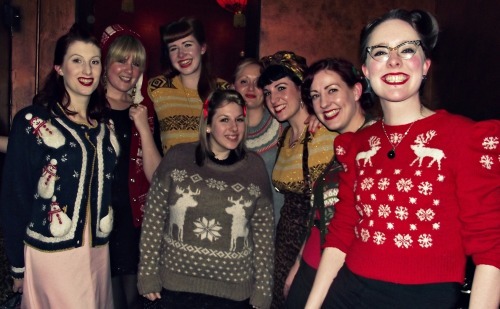 Here we are, aren't we a gorgeous bunch of christmas jumper wearing joy? This isn't all of our party, but only those in christmas jumpers were allowed in the group shot! 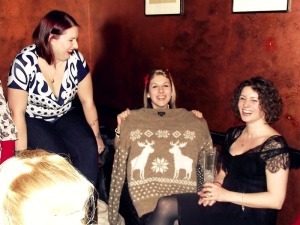 Ellen won best jumper for her red reindeer number - she knitted it herself for the occaison! Genius. It makes me want to learn to knit. It was a great chance to let our hair down, have a good catch up chat, and celebrate all that 2011 brought us. We really are such a warm and fabulous group, and having most of them (some were sadly ill or having to work) in one room. Watch out 2012 - The Wonderful Women are coming. Can a lady have too many lipsticks?